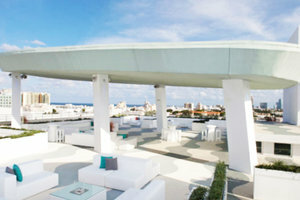 Offering a beautiful 8th floor, right in the heart of Lincoln Road, our rooftop offers spectacular 360 degree views of the city skyline and Atlantic Ocean. It is ideal for a Product Launch, Corporate Event or Private Sale. Modeled after a luxury yacht deck our venue is the perfect space for any sophisticated wedding or event. 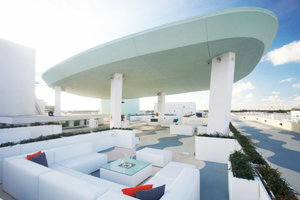 Spanning 3,700 square feet of prime rooftop space, this gorgeous venue boats a dynamic design that's unmatched in the city of Miami. Sleek & contemporary, the design is characterized by smooth surfaces and rounded edges. 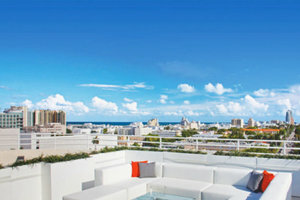 The gorgeous scenery provides a dramatic back drop for your "I do's" or the perfect conversation starter over cocktails. For the perfect reception, enjoy an expert sound system & projector system that is easily on-par with any nightclub in the area, allowing you to celebrate your union in true style. Furthermore, with it's exclusive VIP feel, extraordinary design and excellent event planning staff our rooftop creates singularly superior venue for your wedding day, your corporate event, your rehearsal dinner or birthday party!